AXE Body Spray for Men Essence 4 oz is part of the Essence male grooming range from AXE. It is a fragrance that captures your light and dark sides. A deep, woody aroma and a hint of oriental spice keep you smelling great. 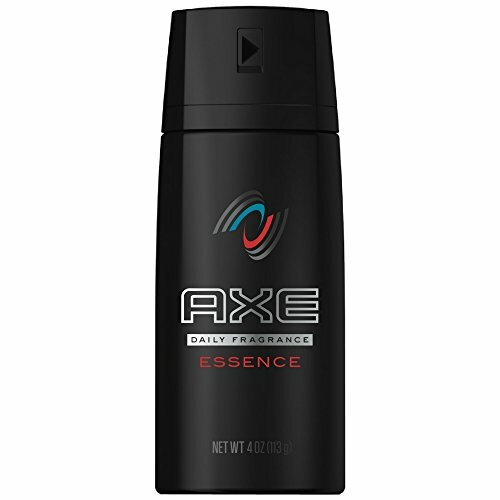 A few quick sprays of AXE Body Spray for men Essence 4 oz is all you need. First twist the cap and then target your body and neck for a lasting great smelling fragrance that makes a lasting impression. Boost your sweat and odor protection with AXE Antiperspirant Deodorant Stick for men 2.7 oz, get clean and fresh with AXE Body Wash for men 16 fl. Oz, and complete the range with AXE 2-in-1 Shampoo and Conditioner for men 12 fl oz. AXE Body Spray for men Essence is also available as a Twin Pack so you can have one at home and one on the go. And check out our other AXE body spray for men scents, like Phoenix, Excite, Dark Temptation, and Anarchy. FIND YOUR MAGIC with AXE Body Spray for men Essence 4 oz from AXE Grooming For Men. Wondering why the can says AXE Daily Fragrance? AXE Body Spray for men is now known as AXE Daily Fragrance. The same great scents that you know and love, now with fresh redesigned packaging.